Welcoming a baby into your life is an exciting and joyful time. But it’s understandable if you’re also nervous about it. It doesn’t take long for them to start crawling around and learning how to walk. Once they’re mobile, it’s important to make sure your home is a safe place for them. Keep the following tips in mind for babyproofing your home. As babies get older, they enjoy climbing on furniture and reaching for items on shelves and other high places. Bookcases, televisions, dressers and other large pieces of furniture and electronic equipment can tip over, resulting in serious injuries. In fact, furniture and other items tipping over sent roughly 21,000 children to the hospital with injuries between 2011 and 2013. In order to lower this risk, you should use anti-tip brackets to secure dressers, bookcases, and similar items to the wall. You should mount televisions to the wall or place them on TV stands or media centers. Electrical outlets are typically located on the lower part of walls, which makes them easy targets for babies. Young children can be severely shocked or burned if they stick items, such as paperclips, into electrical outlets. Roughly 2,400 children end up with these kinds of injuries each year from outlets. Putting outlet caps or covers over electrical outlets helps reduce the risk of these injuries. However, it’s too easy for your little one to remove caps and they also present a choking hazard. Keep in mind that these aren’t the only ways to make outlets safe. Installing tamper-resistant electrical outlets provides even more safety than caps and covers. If your home was built prior to 2008 it’s likely you don’t have tamper-resistant outlets. Babies learn about their environment by sticking objects in their mouth. Electrical cords and wires can cause serious injuries if babies put them in their mouth while they’re plugged in. Cords and wires are also tripping hazards for babies who are learning how to walk. They’re also dangerous if young children play with them or put them around their neck. Keep cords and wires hidden away with cord covers or by securing them to the wall in an area that your baby can’t reach. If you find yourself running extension cords because your outlets are in an inconvenient location, it may be time to add a few outlets to your home. Babies are curious by nature, which means that they love to explore cabinets, drawers, and cupboards. Since these areas often contain items that could harm your baby, such as knives or cleaning products, you should make sure to lock them from tiny hands. Use childproof locks on drawers, cabinets, and cupboards, which helps keep your baby from opening them. You’ll still be able to get them open easily enough, but your baby will be safe from any harmful items in these areas. Leaving toasters, hair dryers and other electronics and small appliances plugged in when you’re not using them can be dangerous if your baby is able to reach them. To reduce the risk of electric shocks and other injuries, make sure to unplug these items when they’re not in use. 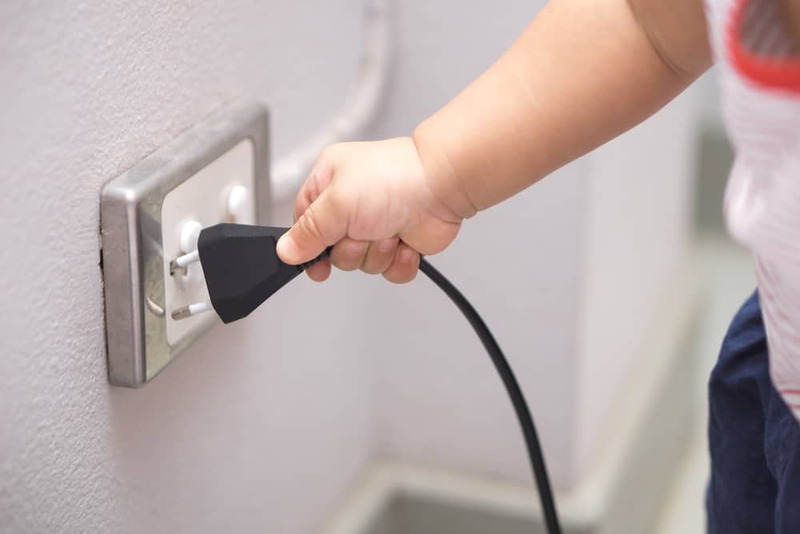 If you find yourself worrying about the electrical hazards in your home, contact Turn It On Electric to learn more about our babyproofing services. Our expert electricians can help you make your Phoenix home safer for your baby.